Every now and then, a ring comes along that doesn’t follow a standard path. Because of our ethical guidelines, we are limited in what gems we can source. We do all we can to offer traceable diamonds and gemstones that have been ethically/safely processed (cut and polished). Most of the time, we’re able to find something that will work, so I haven’t had to do too much creative sourcing. The colour and the size the customer was looking for just couldn’t be found. She wanted something with a hint of colour, but the right sort of colour. We tried everything we could find from topaz to zircon, and nothing was right. Finally, I decided to scour the vintage market to see if I could find a ring with a gemstone that we could use. 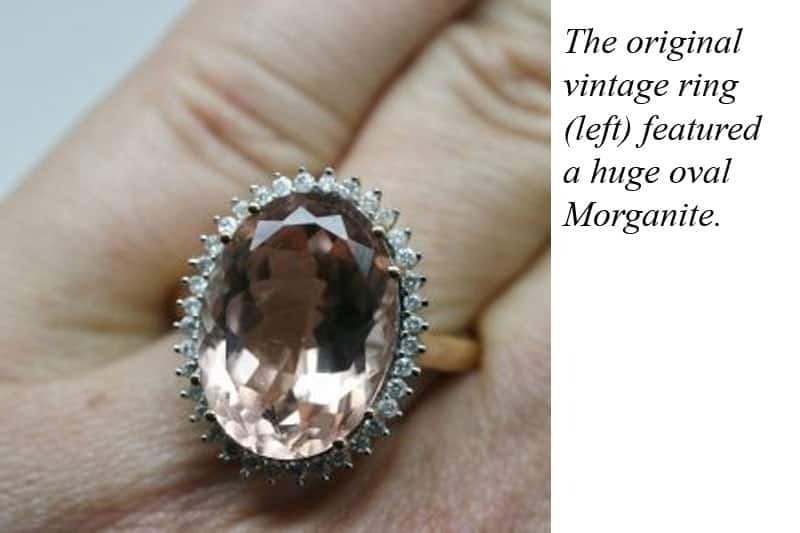 I was very lucky to find a massive oval morganite in a yellow gold setting from someone in the UK. After much discussion and many photos, the customer and I felt confident enough to take a gamble on it – and, fortunately, we were right. 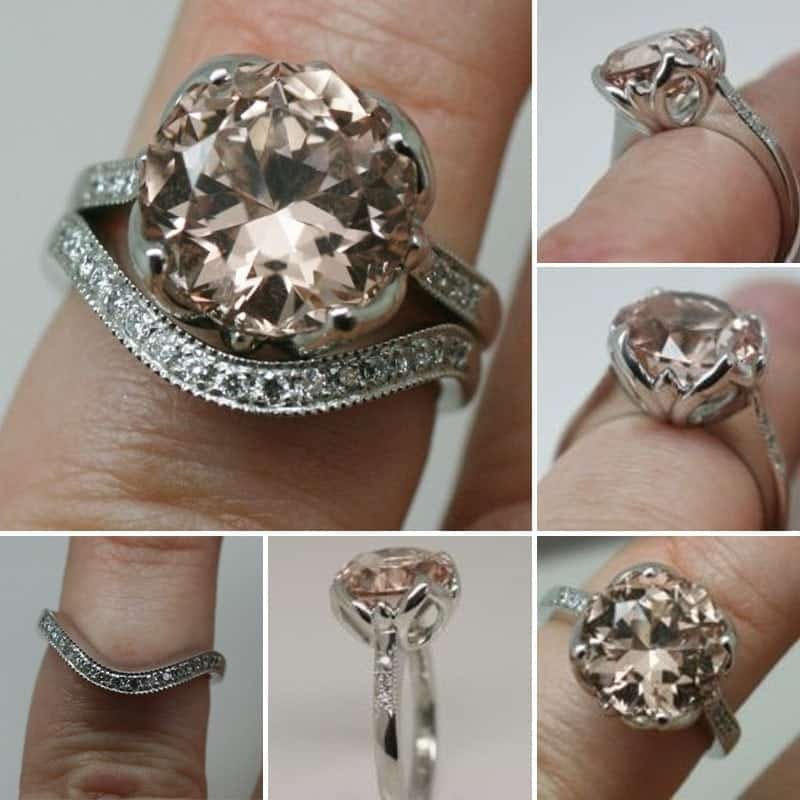 The morganite measured 16 x 13mm. It was nice, but it needed a makeover. We worked with Doug Menadue from Bespoke Gems. The customer chose the cut and size she wanted (antique round 11mm) and we sent it off to Doug for cutting. In the meantime, one of our jewellers, Chris, met with the customer and her partner several times and between them decided on the design. Chris created renders for the ring and a fitted wedding ring to go with it. These are just used as a visual guide for the customer – all of our jewellery is handmade from scratch. After all of this (the process started in January), the rings were finally made in July. 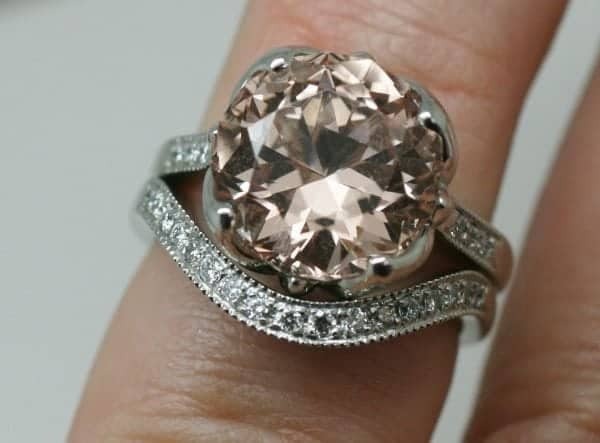 The morganite measures 11mm in diameter and weighs 5.3 carats. The diamonds are from the Argyle mine in Western Australia and the ring was made with recycled platinum. It is strong, heavy, beautiful, and the customer absolutely loves it. And it fits her to a tee. It was a mission to get it done, but so worth the effort. The point of what we do is to make sure that the ring you end up with is exactly what you were hoping for. Sometimes, it’s a straightforward process and sometimes it’s a meandering road. No matter what it is, we are there every step of the way, answering questions and helping you to get the right thing, either for yourself, or as a surprise for your partner. If you would like to create your own handmade engagement ring, why not download our design guide. Or if you would like personal guidance, just contact us directly and we would be happy to help. We work with people all over Australia to create beautiful, ethical handmade engagement rings, wedding rings and more and we love what we do.